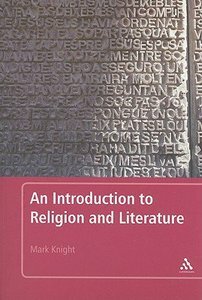 Mark Knight provides a lucid, accessible and thoughtful introduction to the study of religion and literature. - Publisher Organised around important theological ideas, this is a lucid, accessible and thoughtful introduction to the study of literature and religion. Religion has always been an integral part of the literary tradition: many canonical and non-canonical texts engage extensively with religious ideas and the development of English Literature as a professional discipline began with an explicit consideration of the relationship between religion and literature. Both the recent theological turn of literary theory and the renewed political significance of religious debate in contemporary western culture have generated further interest in this interdisciplinary area.This book offers a lucid, accessible and thoughtful introduction to the study of religion and literature. The focus is on Christian theology and post-1800 British literature, although substantial reference is made to earlier writers, texts from North America and mainland Europe, and other faith positions. "An Introduction to Religion and Literature" is organised around important theological ideas, each of which is explored through close readings of well-known and influential literary texts. Throughout the book the reader is encouraged to think about the ways in which religion and literature combine to trace and disclose other worlds that might be seen as sacred. About "An Introduction to Religion and Literature"
Organised around important theological ideas, this is a lucid, accessible and thoughtful introduction to the study of literature and religion. Religion has always been an integral part of the literary tradition: many canonical and non-canonical texts engage extensively with religious ideas and the development of English Literature as a professional discipline began with an explicit consideration of the relationship between religion and literature. Both the recent theological turn of literary theory and the renewed political significance of religious debate in contemporary western culture have generated further interest in this interdisciplinary area.This book offers a lucid, accessible and thoughtful introduction to the study of religion and literature. The focus is on Christian theology and post-1800 British literature, although substantial reference is made to earlier writers, texts from North America and mainland Europe, and other faith positions. "An Introduction to Religion and Literature" is organised around important theological ideas, each of which is explored through close readings of well-known and influential literary texts. Throughout the book the reader is encouraged to think about the ways in which religion and literature combine to trace and disclose other worlds that might be seen as sacred. Mark Knight (Ph.D. at Kings College, London ) is Senior Lecturer in English Literature at Roehampton University, UK. He is the author of Religion, Literature and the Imagination, An Introduction to Religion and Literature. London: Continuum, Nineteenth-Century Religion and Literature: An Introduction. and Chesterton and Evil. Acknowledgements; Introduction; 1. Disclosing Sacred Wor(l)ds: The Doctrine Of Creation And The Possible Worlds Of Literature; 2. Beings In Relation: Otherness, Personhood And The Language Of The Trinity; 3. Mediating The Divine: Law, Gift And Justice; 4. Interpretative Communities: Scripture, Tolerance And The People Of God; 5. The Stain Of Sin: Traces Of Transgression In The Modern World; 6. A Hope And A Future: Suffering And Redemption In Eschatological Perspective; Bibliography; Index.